Earn up to 12,000 reward points. Creamy tube tone and silky spring reverb. This all-tube beast is your first choice for many different sound styles. With a host of practical features and a clearly arranged control panel, handling this amp is a piece of cake. The Screamer's opulent visuals are certainly arresting, but its unique, creamy tube tone and silky spring reverb truly set this amplifier apart. The Screamer comes complete with a bit of technical wizardry which you'll find useful where it counts most: out there in the real world of rehearsing and gigging. Among these features are a Lo/Hi Gain switch, which in effect doubles your choice of channels from 2--Clean and Lead--to 4-- with the addition of Crunch and Heavy Lead settings. You also get 2 different connection systems for footswitches: conventional 1/4" jacks as well as a port for the ENGL compact footswitch Z-5 (sold separately). 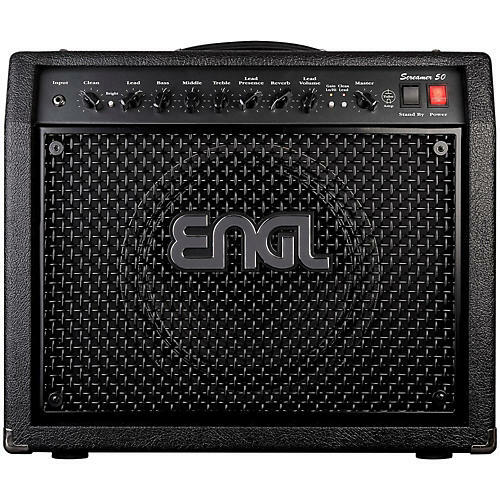 If you want to play smashing rock with tamed gain, this should be the amp of your choice. Killing tube tone and incredible handling ease are the trademarks of this amp line. Sparkling clean, harmonic crunch and powerful leads are the goodies you'll get from the Screamer. Order today and scream through the Screamer.